October 8th Jewellery, originally uploaded by indiaeden. I have a few precious pieces of jewellery related to Florence, including a locket containing her hair, and a beautiful brooch hand made by a wonderful friend, but this pendant I wear every day, and I love it. The chain is long and it hangs near my heart. 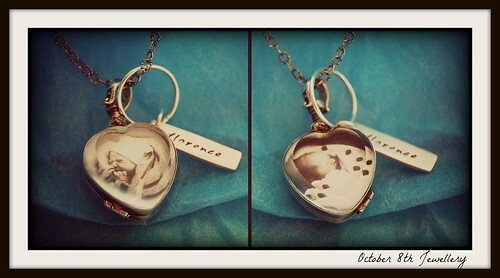 The glass locket contains two photos of Florence. There is also a little silver tag engraved with her name. I don't feel dressed without this pendant, I must handle it and kiss it a million times a day. Ernest loves to look at it and says "Florence", and gives it to me to kiss, then he kisses it too. I love that Ernest has learned to love your pendant too. What a sweet little brother. 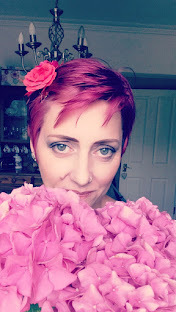 What a beautiful and perfect tribute to Florence and a lovely way to keep her close to your heart.